The Super Bowl is as well known for its commercials as it is for the sport. However, football season isn’t just a great marketing opportunity for giant companies. 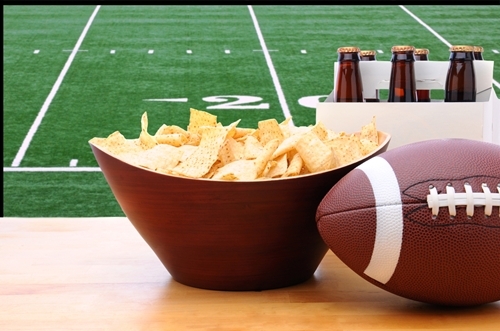 Small businesses who get in on football mania can increase brand awareness through creative marketing. According to Think With Google, analytics show that the National Football League is more popular than professional baseball and basketball. It’s not just popular with men though. Women make up approximately half of NFL fans. The numbers prove that football season is a great time to employ targeted marketing strategies, whether they’re giveaways, advertisements, promotions or events. Make your business a go-to for locals by offering fun and creative promotions during football season. Swipely explained that this doesn’t just apply to restaurants and bars. A promotion can be as simple as offering a few dollars off your company’s product or services when customers are wearing their team’s jersey. Another option is to hand out free Football Stress Relievers to fans on game day. Your small deal will help to boost sales and give your company a chance to score new dedicated customers. This strategy is also great because it doesn’t rely on supporting one team. While there’s certainly a favorite team in your community, don’t alienate fans of less popular teams. Widening your target market can help expand your business. If your staff is big enough, you can create a fantasy football league within your company. However, if you’re a small business, this might not be feasible. Instead, Groupon suggested joining, or starting, a league for other local companies. This strategy is inexpensive and can generate a lot of interest within the community. It will also pave the way for future marketing collaborations. Make sure to post update about your league on social media and talk to customers about it. Fantasy football is almost as popular as the real thing, so it’s a great topic to build relationships with your patrons. Don’t let the professionals get all the attention. Sponsoring a local football team is another way to build brand awareness in your community. Whether its the high school team or a recreational league for young children, you can get your company’s name out there with a small donation to the team. Many leagues will allow you to put an advertisement somewhere around the playing field or in the game day brochures. Send a few staff members to a big game to hand out Custom Malibu Sunglasses to parents and fans. Showing your support for the local team will garner just as much attention as supporting the pros. If your company relies more on online sales than foot traffic, use social media to show your team pride. Luna Metrics explained that there are a few popular methods of hosting social media giveaways. First, you can offer a small promotional object to everyone who likes your page during football season. It can be something as simple as a 22 Oz. Personalized Stadium Cup. Another option is to host a giveaway with only a few winners. Ask social media followers to submit a picture of themselves in their game day attire and choose the most creative looks. For these types of promotions, choose a prize that’s a little more covetable. Some good choices might be a KOOZIE Picnic Basket they can use for tailgating or a special stadium survival kits with all the essentials, like a stadium cushion, rain poncho, blanket and hand warmers.